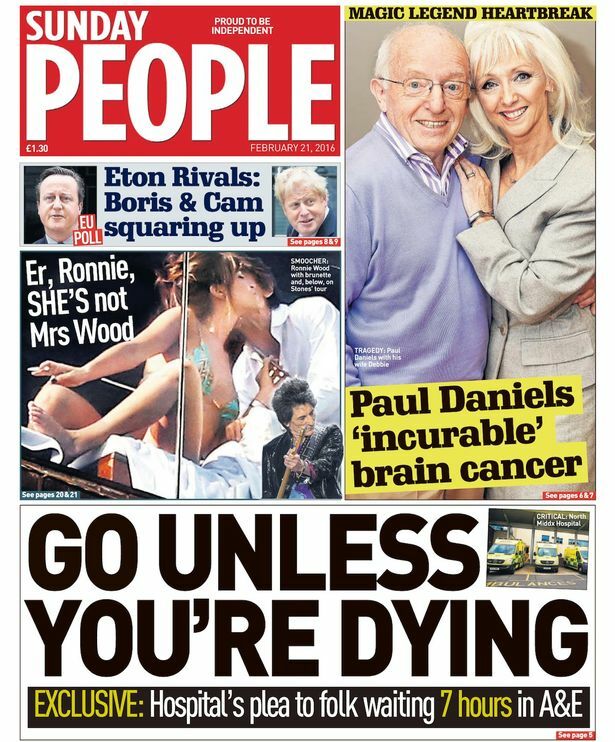 A scandal-hit NHS trust faces a new probe into whether it is to blame for the deaths of nearly 300 patients, the Sunday People can reveal. 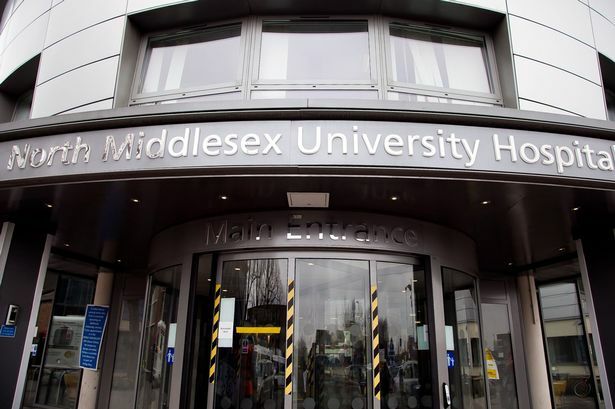 New figures show that 287 deaths were ­recorded as “unexpected” at the North Middlesex Hospital over a two-year period from 2014-2015. Many of those were vulnerable elderly people who needed support to ensure they drank and ate properly. The deaths are contained in official Department of Health figures and show the hospital’s death rate is higher than the national average. It was the collection of such data by Imperial College London that helped expose the high death rates at Stafford Hospital. It had as many as 1,200 additional deaths between 2005 and 2009. Last week, Care Quality Commission inspectors found more failings in the North London hospital’s A&E department after two visits in a month. 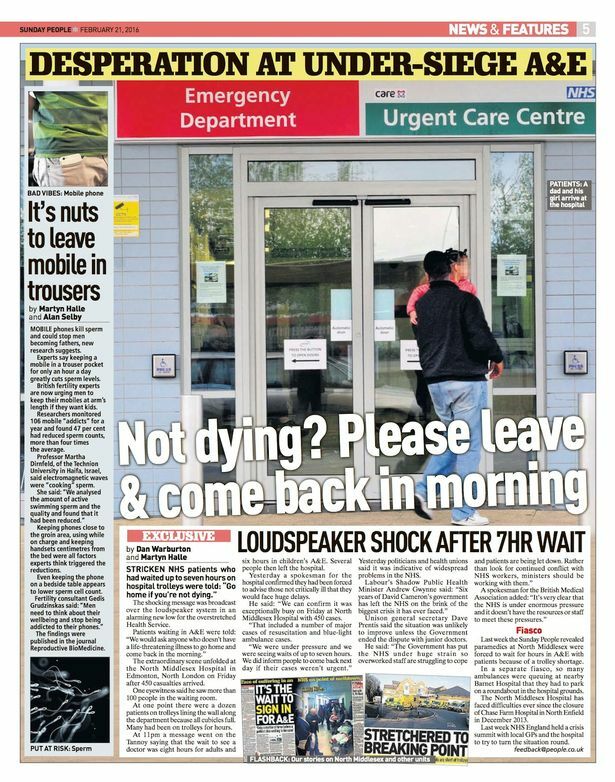 In February the Sunday People ­exposed the dreadful care in the hospital’s A&E after a Tannoy announcement told 100 ­people waiting to see a ­doctor to go home and come back in the morning unless they were dying. In their latest visit, CQC ­inspectors learned that a ­patient had lain dead in A&E for four hours after staff failed to monitor him. They also found a lack of ­consultants and nurses seeing patients who ­arrived by ambulance. And an ­untrained receptionist was deciding which patients saw A&E doctors. On elderly wards, inspectors found evidence that patients were probably being deprived of food and fluids. Records showing how much a patient drank or ate were not kept, and routine medical checks were not performed. Patients were also getting the wrong drugs. Inspectors also found evidence of abuse of patients by staff. Many of those who died at Stafford were elderly people starved of fluids and food. The CQC singled out failures to give fluids and food on North Middlesex’s Charles Coward ward when it failed its care of the elderly unit in 2014. Last January, an NHS whistleblower visited Charles Coward ward and wrote to Trust chief Julie Lowe, Health Secretary Jeremy Hunt and CQC chairman David Prior. She raised concerns about patient safety but they were apparently ignored. 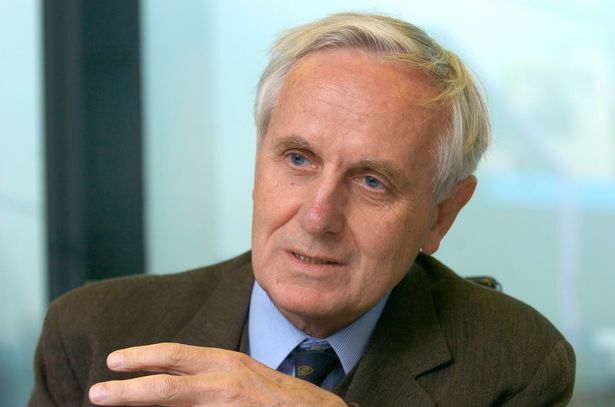 Prof Jarman, of Imperial College London, said the death figures were reminiscent of Stafford and urged the CQC to mount an urgent ­inspection of the hospital. Last year three ­patients died as a result of A&E blunders at the North Middlesex. 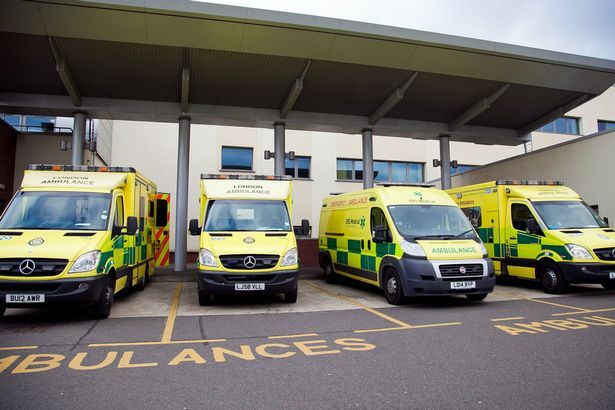 Concern over the safety of A&E patients has led to ambulance crews being told not to use it at night. North Middlesex Hospital was failed by CQC inspectors in 2014. Just days before, local MP David Burrowes nearly died from a burst appendix after he was left on a trolley in A&E for 12 hours. But hospital boss Lowe is on leave. Another NHS manager has taken over. Southampton General Hospital should also be investigated for ‘expected’ deaths on the Elderly Care Unit from 1991 – 1994. All the Drs at all levels except Dr Eastman were involved. Patients with CVAs were admitted and some were treated but many were simply given sedation and subcut fluids until they died. The relatives were told that there was no chance of them surviving ad it was “only a matter of time” Of course they accepted this. The Drs were very careful about what they wrote in notes so they couldn’t be implicated in anything, even phoning each other for advice on what to write. During one meeting I was asked by the Professional Development Sister if I knew the cost of keeping these people alive? She went on to be the manager of a care home so found out 1st hand. Eventually I was dismissed and indicated that i was going to a tribunal and would make it public. Within hours of the management committee being informed of this I was offered a ‘Medical Retirement’ from the NHS which was a very generous lump sum and pension. I questioned the ‘medical’ what medical reason would they use? They replied that they would simply submit the forms as no one checked it would be passed. The terms were enhanced by 10 years I was still in my 40s with 4 growing children so accepted and now over 20 years later I am still collecting the pension. The Internal Enquiry held into the way I had been treated decided that i had been treated in a disgusting way. They didn’t offer me my job back but made changes at the hospital. The Elderly Care Unit became part of the Medical Unit and was no longer was an independent unit. The manager, who was a lovely gentle lady, but wasn’t up to the job was advised to take early retirement, which she did. The deputy manager deputy who was a vicious workplace bully, she was appointed between my acceptance of the post and starting work on the unit. She was demoted and moved onto the medical unit . She had got rid of all the sisters on the unit except for two, myself and one on days who also went through hell. The vacant sisters jobs were filled with junior inexperienced nurses who could be managed and controlled. They hung on her every word.